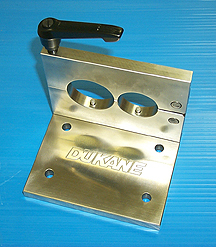 Sturdy stainless steel vise resembling "pilgrim stocks" that clamps around booster or transducer to facilitate disassembly of stubborn components with minimal damage to tooling. Mounts to edge of workbench. 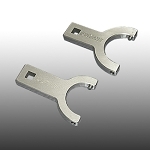 The anti-rotation pins in the vise are replaceable. 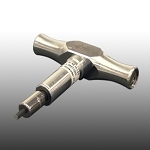 Accepts tooling diameters of 1.5" and 1.81" (standard 20 kHz Dukane transducer front slug and booster end diameters).